Action from Peterborough Sports' (blue) 4-0 win over Oadby. Photo: David Lowndes. Peterborough Sports have sealed promotion from the United Counties League with seven matches to spare. Yesterday’s (March 18) 4-0 home win over Oadby means Sports are certain to finish in the top three of the Premier Division. Next season they could be playing in the same Evo Stik League as local big-hitters Spalding United and Stamford AFC. Peterborough Sports' striker Avelino Vieira (blue) on their way to a UCL Premier Division win over Oadby at PSL> Photo: David Lowndes. Sports have the formality of a ground inspection to pass before promotion is confirmed. They require seven points from their final seven matches to seal back-to-back UCL titles. Mark Jones scored twice as Sports moved on to 93 points. A very young, and game Oadby side provided the other goals. It was an excellent day for all local top-flight sides with the exception of Peterborough Northern Star who slipped to a 1-0 defeat at the hands of Cogenhoe. Action from Peterborough Sports (blue) v Oadby at PSL. Photo: David Lowndes. Second-placed Deeping Rangers and third-placed Yaxley collected superb away wins, while Wisbech (seventh) and Holbeach (eighth) were successful at home. Deeping saw off the challenge of a decent Sileby Rangers side in style. Scott Coupland (2), Charlie Coulson and Tom Waumsley scored the goals in a 4-1 win. 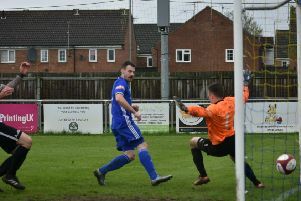 Deeping remain 12 points adrift of Sports, but maintained a healthy seven-point lead over Yaxley who won 2-0 at FA Vase quarter-finalists Newport Pagnell. Liam Hook and Kyle Nolan scored for the Cuckoos. Jake Mason (stripes) of Peterborough Northern Star hurdles a challenge in the game against Cogenhoe. Photo: Tim Gates. Alex Beck and Sam Vince (penalty) saw Wisbech to a 2-0 win over Harborough, while Holbeach responded to a recent tongue-lashing from manager Seb Hayes to beat ON Chenecks 2-0 thanks to goals from Charlie Sanders and Mitch Griffiths. Tigers’ goalkeeper Ricky Drury saved a penalty towards the end. Josh Ford was dismissed for dissent in the aftermath. Jones Da Sousa’s hat-trick and two goals from Scott Ginty enabled Blackstones to win 5-1 at lowly Woodford United in Division One, but Bourne went down 1-0 at Thrapston. Stones are now seven points (but just one place) clear of their local rivals in 14th. Third-placed Spalding United are still favourites for a play-off place in Division One South of the Evo Stik Northern Premier Division after a battling 1-0 home win over Belper. Lee Beeson’s 57th-minute penalty proved decisive for an understrength Tulips’ team. But Stamford probably can’t wait to draw a veil over their campaign. A mini-run of four unbeaten matches came to a shuddering halt as the Daniels were crushed 5-0 by mid-table Stocksbridge Park Steels at the Zeeco Stadium. March Town couldn’t quite secure back-to-back wins in Division One of the Thurlow Nunn Eastern Counties League. Rob Conyard fired the Hares in front at Team Bury, but the home side equalised early in the second half. Stamford 0, Stocksbridge Park Steels 5. Newport Pagnell Town 0, Yaxley 2 (Hook, Nolan). Northampton Sileby Rangers 1, Deeping Rangers 4 (Coupland 2, Coulson, Waumsley). Wisbech Town 2 (Beck, Vince), Harborough Town 0. Woodford United 1, Blackstones 5 (Da Sousa 3, Ginty 2). Team Bury 1, March Town United 1 (Conyard).